Check it out! Kira came down from Oregon to see me again. She stayed with me for a couple days so we had all kinds of quality time in the house, in the morning at breakfast and in the evening. Any time with her is quality time really. Unusual stuff always happens when Kira visits. This time the action was in the kitchen. My (so-called) owner and her went shopping and brought back a couple big boxes of strawberries, cherries, a big box of chocolate eclairs, cupcake mix and four cans of frosting. So you'ld think there would be some kind of dessert-o-rama or something, but I never saw any of it getting eaten. It seemed to disappear. It's just a mystery. 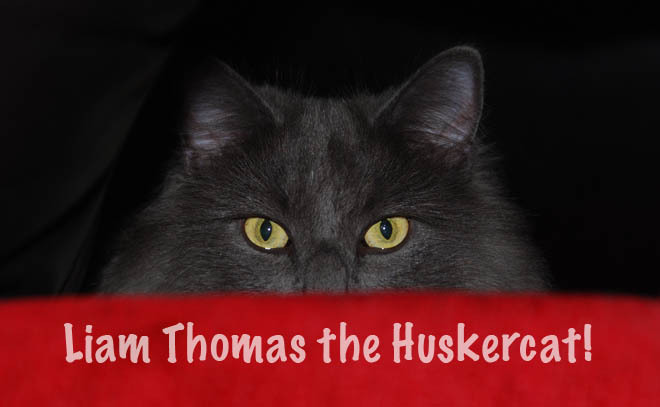 You gotta tolerate mysteries if you're the Huskercat and reside at this place. 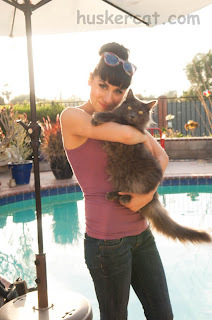 Anyways, my photographer got some pics of me and Kira (see below). They're all pretty cool. It's obvious she's really into me! And check out the bottom of my post where she's visiting a Huskery Club of some kind out in the middle of the Mojave Desert (fyi, desert is unrelated to dessert). Me - getting the big squeeze! She's a real snuggle puss! This photographic representation of me and Kira is a little more formal. None of the head bumpin' and huggin'. They probably wanted a more formal picture in case it is needed for a press release. Note my litter changer screwing with my ear. What the hell's up with that??? And why is he insinuating his ol' self into my photos with my fans??? That's what I want to know. He should get his own fans! Kira is being quite gracious and pretending to have fun with him. Ya gotta hand it to my owner and Kira. They ventured out to the California Desert to find the local Husker Club. It was 105 deg out there! The locals told them it was good that they didn't visit on one of the really hot days! I'd describe it as a barren wasteland but that would be rude.